The Model 3 is headed to Europe. On Monday, Reuters confirmed that the Netherlands Vehicles Authority (RDW), a governing body responsible for clearing vehicles for use on European roads, had approved Tesla’s request to begin delivering its Model 3 vehicles to European buyers — putting Tesla one step closer to its goal of getting its vehicles into all available markets. Tesla currently has more than 15,700 Model 3 orders from European drivers to process, and now that it has approval from the RDW, it can move forward with delivering those cars to drivers. According to a Teslarati report, the plan is to ship 3,000 Model 3s to Europe every week starting in February, and it looks like that process has already begun — in the past couple of weeks, multiple Twitter users have shared photos of Teslas arriving at San Francisco’s Pier 80, presumably en route to Europe. Last week, Tesla announced plans to lay off 7 percent of its staff in an effort to help the company meet its goals. One of those goals is delivering the mid-range Model 3 variant to “all markets,” according to CEO Elon Musk’s email announcing the layoffs. 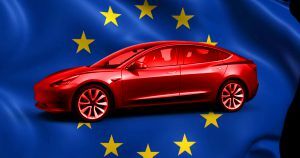 Now that Tesla has received the RDW’s approval, it can scratch Europe off its list of markets still waiting for the vehicle.